The AED Armor White Metal Indoor Cabinet with Alarm gives you the added safety feature of an alarm that sounds once the cabinet is opened. This will reassure the first responder knowing that bystanders in close proximity will be notified of the emergency situation. Universally designed, this cabinet is Ideal for storing defibrillators regardless of the manufacturer or brand. The cabinet guarantees that your device will be well guarded whilst being clearly visible to staff and members of the public. This cabinet is to be mounted on a wall in a location of your choice to guarantee your defibrillator with optimum protection, and is an effective way to store your device in a secure yet clearly visible place. Why is it important that an AED is easy to locate? It is vital to close the time between the collapse of the victim and the time it takes for them to receive treatment as much as possible. The immediate moments following a cardiac arrest are the most crucial, with survival chances decreasing by approximately 10% per minute without correct treatment. Easy location and retrieval of the device will ensure the victim receives prompt treatment, increasing their chances of survival. The cabinet’s alarm will also trigger when you open the cabinet, alerting members of the public that there is an emergency situation and prompting them to assist you through the rescue process. 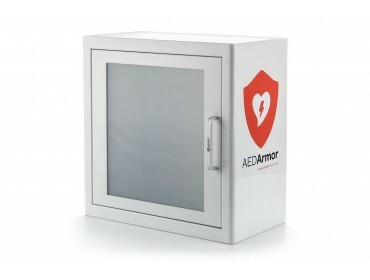 If you require further information about the AED Armor White Metal Indoor Cabinet with Lock, please do not hesitate to get in contact with a member of the AED Armor team who will be happy to assist you. Simply call 0330 678 0246 and they’ll be happy to share their knowledge with you.